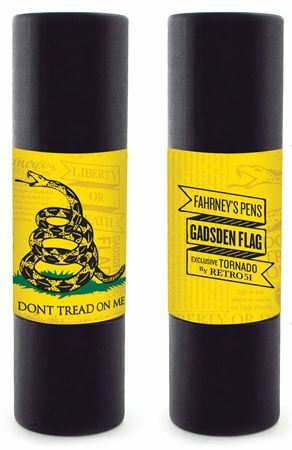 Order your Retro 51 Exclusive Gadsden Rollerball/Ballpoint Pen today from FahrneysPens.com. Fine Pens, Refills & Luxurious Gifts – great prices & fast shipping. ‘Don’t Tread on Me’, states this rattler. 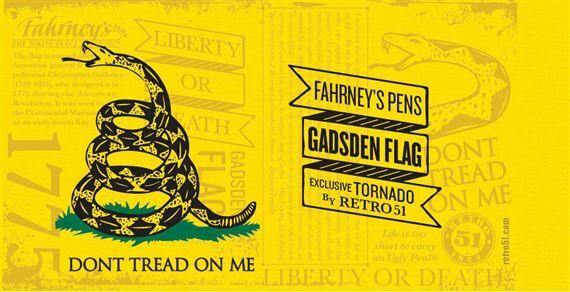 Fahrney’s Pens presents its new special edition flag pen for 2018 – the Gadsden. Based on the well-known Gadsden Flag, the pen takes you back to 1775 when the British occupied Boston and the Second Continental Congress approved the mustering of five companies of Marines to accompany the new Navy on its first mission. Continental Colonel Christopher Gadsden of South Carolina was a member of the Marine Committee that was outfitting the mission. Before departing, the newly appointed commander-in-chief of the Navy, Commodore Esek Hopkins, received the yellow rattlesnake flag from Gadsden to serve as the distinctive standard of his flagship. Considered one of the first flags of the early United States, it was later replaced by the Stars and Stripes. The Gadsden rollerball features the fearsome rattlesnake coiled and ready to strike on a textured yellow finish with antique silver-colored trim. Screen-printed around the snake are the Revolutionary War slogans, ‘Don’t Tread on Me’ and ‘Liberty or Death’. The Retro Tornado pen has a twist-top mechanism and can utilize rollerball or ball pen refills. The special edition ships in a custom-designed tube. 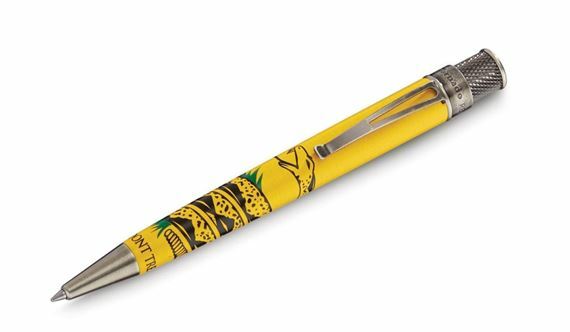 Writing with a limited production Gadsden pen will surely show that your spirit will not be trampled on by others! The colors are vibrant and the overall design on the barrel is very beautiful. This pen writes very well. 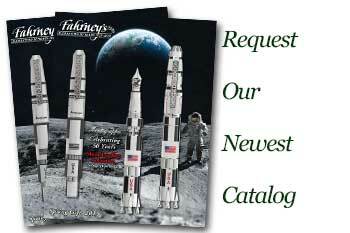 I am looking forward to purchasing additional pens from Fahrney's.